Okay, just the title, Snow Biking, tells you this will be a ridiculous story (with a good ending so keep reading.) Snow and biking should never be in the same sentence. Seriously. But I learned that the hard way. Yes, I went snow biking. For my fellow Southerners, let me explain what the heck snow biking is. Snow biking is when you get on what southerners would call a mountain bike except it has super fat tires with super thick tread – for the snow! I was at a resort somewhere in Minnesota with my husband for a work related event. 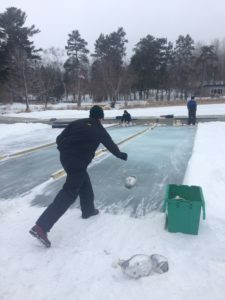 There were lots of activities we could choose from during the “breaks” like ice fishing (nope), cross-country skiing (boring) or turkey bowling on the frozen lake (did it.) Even though it was about 28 degrees – a “nice day for biking” according to the crazy Northerners in the group – a group of guys (that was my first mistake) were talking about going for a bike ride. I was beginning to get a little stir crazy in the lodge and since I cycle, it seemed like a good opportunity to get out. When I say, “I cycle,” what I mean is I ride a 21-speed bike down fairly flat, smooth roads and only use a gear or two. I push the pedals and the wheels turn without a whole lot of effort. Oh, and I usually only cycle when there isn’t a lot of wind, no rain and the temperature is between 55 and 85 degrees. Once the guys found out I was interested in biking, they were kind to include me and I sort of felt obligated to go with them. I questioned how one dresses to ride a bike when it’s 28 degrees outside. That was mistake number two – never trust a Northerner’s advice about how to dress in the snow. I listened to what they said they would wear and then I added another layer – or two. I met the group of guys at the bike shed and off they went – uphill. Before we rode our first half-mile, my chest was about to explode and I could hardly catch my breath – and I was hot and sweating because of the added layers. I had fallen behind – because it is really hard to pedal a bike through deep snow! The group of guys waited ahead of me – which was worse than leaving me behind – because they could see how much I was struggling. I was so embarrassed. But I am also very competitive so I tried my best to act like it was just another easy ride for me. I made some excuse about needing to put my sunglasses on and told them to go ahead. One guy in the group saw through my rouse and seemed hesitant to go without me. My competitive streak kicked in and since I didn’t want anyone to hang back for me, I said I was fine and took off with the group after hastily shoving my sunglasses on my face. After riding up and down some hills, I fell behind again but when I came around a turn, they were waiting for me. I tried to control my breathing so they wouldn’t know how hard I was working to keep up. One guy tried to tell me something and kind of gestured to my head. I was mortified I was struggling so much and cut him off. I’m not sure what I said but he recoiled at my tone and my words. I saw him pause a minute and I knew he was thinking about whether he should try to tell me again whatever he wanted to tell me. Then he, wisely, decided not to. We took off riding again. When we got to some flat ground, I felt something flopping on the side of my head. When I stopped to investigate what it was, I realized my beanie hat had worked its way off the top of my head and was only being held on by the temple of my sunglasses I somehow stuck through the hat when I was trying to breathe at the first stop. That’s what the guy was trying to tell me. My hat was about to fall off. My beanie looked like a big, floppy dog ear hanging off the side of my head. And the nice guy was just trying to help me out. There have been many times in my life when I didn’t want to hear the truth due to my embarrassment, pride or stubbornness. I would rather keep pedaling down the difficult path than to stop and deal with the real issue. But just like my hat wasn’t going to go back on my head on its own and I had to stop and deal with it, it is better for me to deal with the issues then to try to keep going – looking like an idiot. Dealing with tough issues in our lives isn’t fun. The work is hard. I don’t like to deal with unforgivenes, offenses, pride, stubbornness, wrong-thinking and…the list goes on. But when I do and get to the other side, a healing of my heart and soul takes place. Life is better. As Christians, we are cautioned not to be prideful. We are supposed to forgive. We are supposed to build each other up and not tear each other down with our words. I can almost guarantee you I won’t ever go snow biking again. And I can almost guarantee you I will have to continue to deal with my sinful nature. Ugh! What about you? Do you ignore the issues that keep you from living a life characterized by love, joy, peace, patience, kindness, goodness, faithfulness, gentleness and self-control? If so, take it to the Lord. Just like the kind man tried to help me out, the Holy Spirit (our Helper) will kindly and gently lead you. Share the post "Snow Biking – Really, that is a “Thing”"